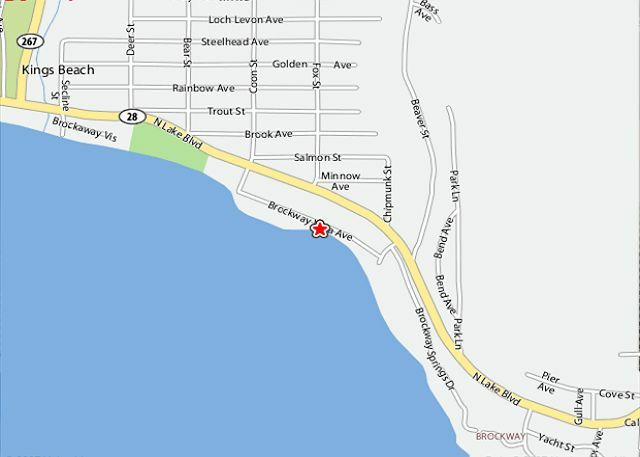 Located in Brockway - approximately 9 miles east of Tahoe City. Open living/dining area with panoramic lake views, beamed ceilings, lots of natural wood throughout, wet bar, beautiful stone fireplace, fully equipped kitchen, cable TV, washer/dryer and lovely lake views from two of the downstairs bedrooms. 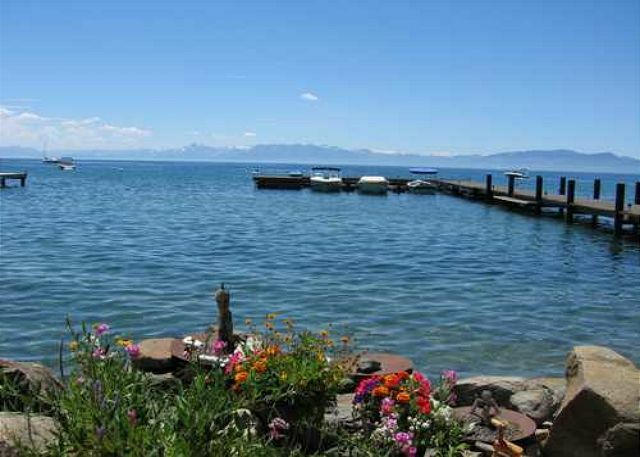 For your summer enjoyment this lakefront home has a 200 foot pier, 2 buoys, 1 boat slip, nice lawn area and propane BBQ grill. There is also a guest house that can be booked as well. Not far from Kings Beach Recreation Center, enjoy sandy beaches, swimming, parasailing, canoeing, kayaking and basketball court. Kings Beach also offers a boat launching facility depending on lake level. Other outdoor activities include hiking trails, biking, boating, water skiing, fishing, sightseeing and dinner cruises on the lake, downhill skiing, cross country skiing and snowmobiling. 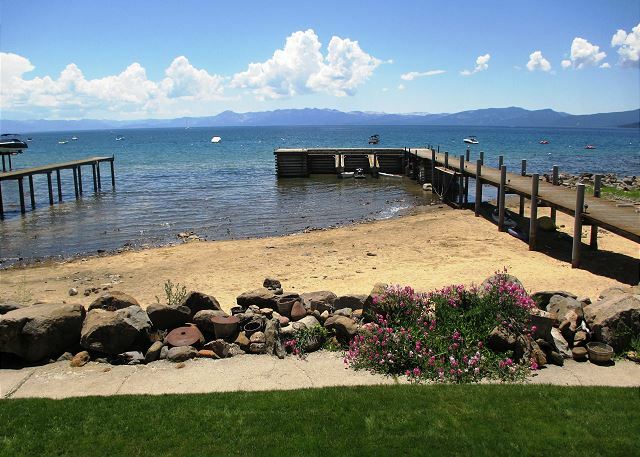 This North Lake Tahoe vacation rental is also close to Brockway Golf Course, Northstar-at-Tahoe, Mt. Rose and Incline Village. The North Shore casinos with gambling, great food and music/dancing at Crystal Bay are just 5 minutes away. Walk to restaurants and shopping. Fantastic views. That is the best feature of this house. Very large and open with plenty of bedrooms. The inside is in desperate need of updates, especially the kitchen. Beautiful property. The view couldn't have been better. Plenty of room for family. Great location. We had a very nice stay. We have stayed there before and we will again. The location is great: private sandy beach, quiet, safe street, walking distance to restaurants, playground etc. What improvements would I suggest? Paint the downstairs bedroom walls white, or put in ceiling lights; those rooms are very dark, especially when you come in from the sunshine during the day. Another shelf for toiletries in each bathroom would be nice. And put the bear-proof trash box OUTSIDE the fence so the trash guys can easily pick up weekly - all the other houses do. Special thanks to Lisa for setting up our trip arrangements flawlessly once again.